Explore Rome’s historic sites in classic Italian style with a scooter tour of the city, then get skip-the-line access to the Colosseum, Palatine Hill, and the Roman Forum for a comprehensive guided visit. The route takes in landmarks such as the Circus Maximus, the Trevi Fountain and St. Peter’s Basilica, before the ancient heart of the city. 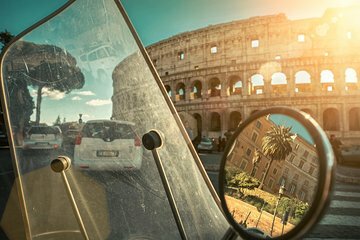 This combination tour is the perfect way to get oriented to Rome’s fascinating neighborhoods and culture, and includes entrance fees, scooter rental, and insurance. Make your way to a meeting point in central Rome for 9:30am departure, and get fitted with a scooter helmet—a minimum of two people are required per booking, so you can double up on the scooter and take turns driving throughout the morning. The 3-hour scooter tour of Rome follows a different route each time to keep things fresh, but you’ll stop at several of the following locations: Circus Maximus, Aventine Hill, the Orange Garden, Marcello’s Theater, Venice Square, Trevi Fountain, Navona Square, Castel Sant'Angelo, St. Peter's Basilica, and Gianicolo Hill. Wrap up the scooter tour at the Colosseum, where you’ll walk right past the long lines for a 1-hour guided visit that includes Palatine Hill and the Roman Forum. Hear stories about Rome’s fierce battle, gladiatorial combat, and entertainment as you make your way through the first and second tiers of the Colosseum. The adjoining Palatine Hill and Roman Forum are part of one the city’s most historic areas, and evoke the time of Roman senators and the Rome’s founding mythology. Explore the main landmarks in the archeological sites, and learn how the city fell into ruins after the end of the Roman Empire. This half-day tour concludes at the original departure point.